We have the same problem LOL. Have a wonderful Wednesday. Hi Faraday! That's a problem, alright. You are obviously seated at the table, and ready to nom. 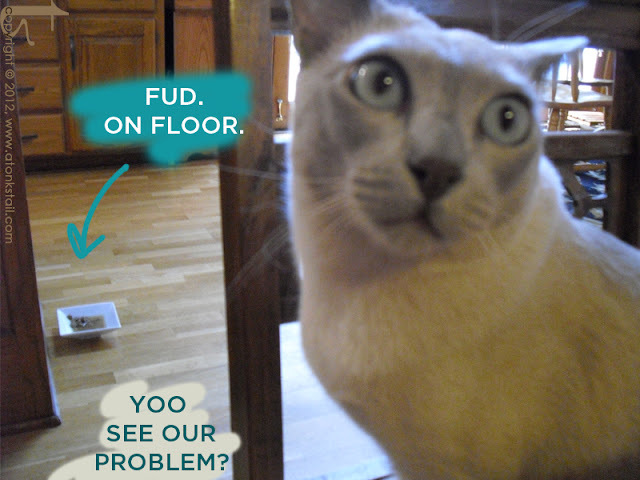 Why is the fuds on the floor??? Shocking! That's what it is. uh oh...I think I see a closed door? The humans should try floor dining and see how THEY like it! Well for one thing the fud definitely should be delivered - whatever happened to room service????? I think that is a reportable offence!! Oh, no, no, no! Noms is not for nomming on the floor! Ask if you can have noms on bed like us peoples. The food wasn't brought to you? On a silver platter? So totally, I'm not kissing you!! Yikes, there does appear to be a wee bit of a problem here...have a great week kitties! Well, that's just not right...not at all! You are a funny kitty! Happy Wednesday.